Dr. Chris Dodd joined the Thompson’s Station clinic in April 2015. Dr. Dodd is a native of Williamson County and a graduate of Brentwood High School. He moved to Alabama after graduation to pursue his college education. Dr. Dodd received his undergraduate degree in Biology from Samford University. He completed his Ph.D. in Immunology, Medical School degree and Pediatric Residency at the University of Alabama at Birmingham (UAB). 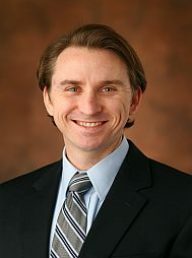 After his residency completion in 2012, Dr. Dodd and his Family moved back home to Middle Tennessee where he began a Fellowship in Pediatric Oncology at Vanderbilt. Upon realizing his heart was in General Pediatrics instead of Oncology, he made the switch and has been practicing as a Board Certified Pediatrician since.